Now everyone can enjoy the Baja, indoors and out, on tabletops and floors and anywhere you like! 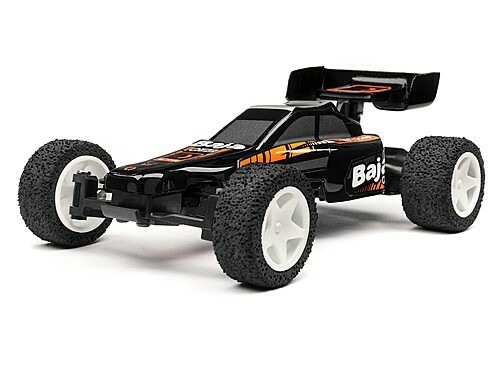 The Q32 chassis is the smallest member of the HPI family, and it's a fun way to get your RC fix on rainy days or when you're stuck in the office! Fitted with grippy foam tires and a direct rear-wheel drivetrain, it's light, nimble and FAST! At just 109mm (4.3") in length and 76mm (2.9") wide, it's ideal for racing in the smallest of spaces! We've also included 8 corner markers and even a cool mini-ramp to get you started making your own custom race courses! 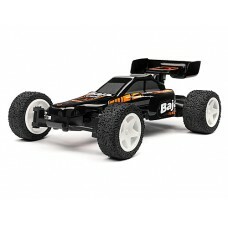 The Q32 features awesome "Real Steer", which means the car drives just like a larger RC car!